Learn how to generate a Resource Manager template using the Azure portal, and the process of editing and deploying the template from the portal. 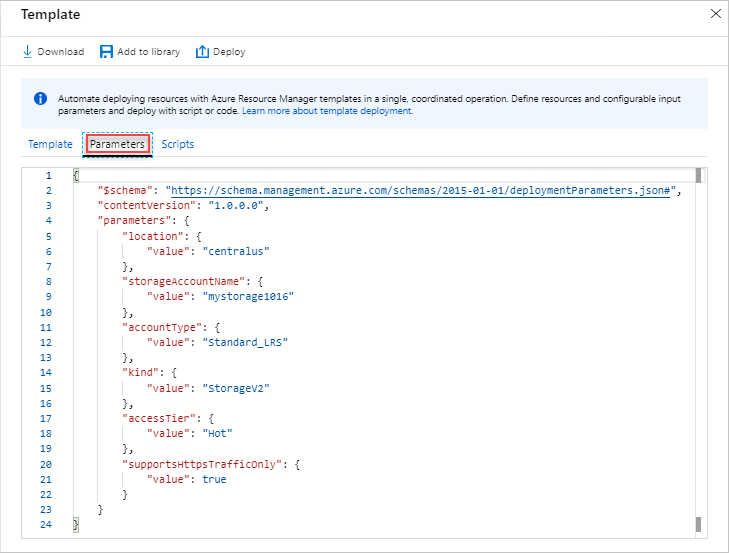 Resource Manager templates are JSON files that define the resources you need to deploy for your solution. To understand the concepts associated with deploying and managing your Azure solutions, see Azure Resource Manager overview. After completing the tutorial, you deploy an Azure Storage account. The same process can be used to deploy other Azure resources. 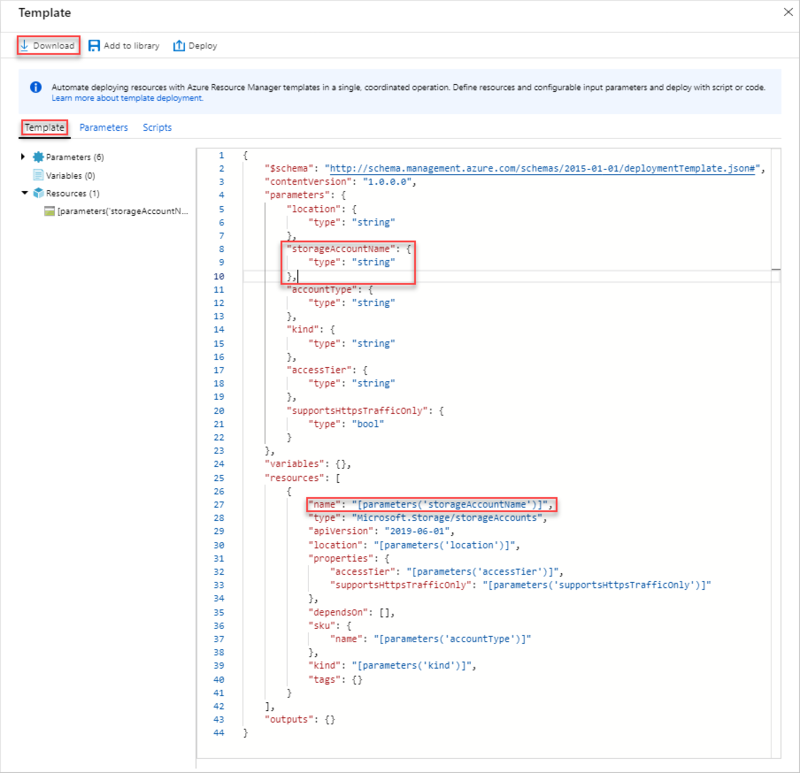 Creating a Resource Manager template from scratch is not an easy task, especially if you are new to Azure deployment and your are not familiar with the JSON format. 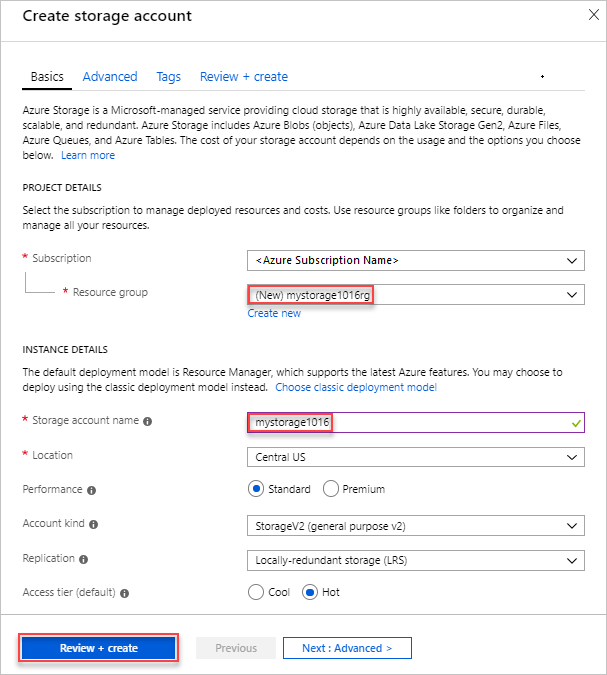 Using the Azure portal, you can configure a resource, for example an Azure Storage account. Before you deploy the resource, you can export your configuration into a Resource Manager template. You can save the template and reuse it in the future. 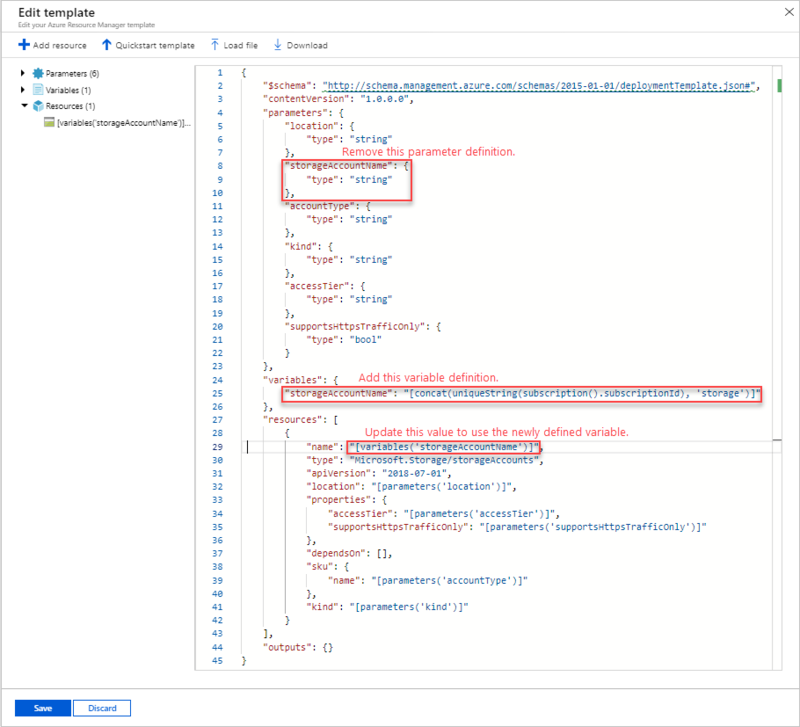 Many experienced template developers use this method to generate templates when they try to deploy Azure resources that they are not familiar with. For more information about exporting templates by using the portal, see Export resource groups to templates. The other way to find a working template is from Azure Quickstart templates. Select Create a resource > Storage > Storage account - blob, file, table, queue. Resource group Select Create new, and specify a resource group name of your choice. On the screenshot, the resource group name is mystorage1016rg. Resource group is a container for Azure resources. 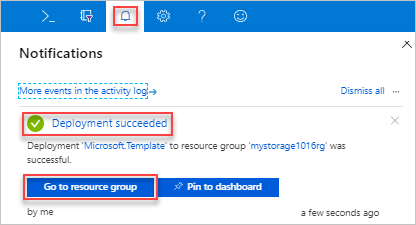 Resource group makes it easier to manage Azure resources. Name Give your storage account a unique name. The storage account name must be unique across all of Azure, and it contain only lowercase letters and numbers. Name must be between 3 and 24 characters. If you get an error message saying "The storage account name 'mystorage1016' is already taken", try using <your name>storage<Today's date in MMDD>, for example johndolestorage1016. For more information, see Naming rules and restrictions. You can use the default values for the rest of the properties. Some of the exported templates require some edits before you can deploy them. Select Review + create on the bottom of the screen. Do not select Create in the next step. There are six parameters defined. One of them is called storageAccountName. The second highlighted part on the previous screenshot shows how to reference this parameter in the template. In the next section, you edit the template to use a generated name for the storage account. In the template, one Azure resource is defined. The type is Microsoft.Storage/storageAccounts. Take a look of how the resource is defined, and the definition structure. Select Download from the top of the screen. Open the downloaded zip file, and then save template.json to your computer. 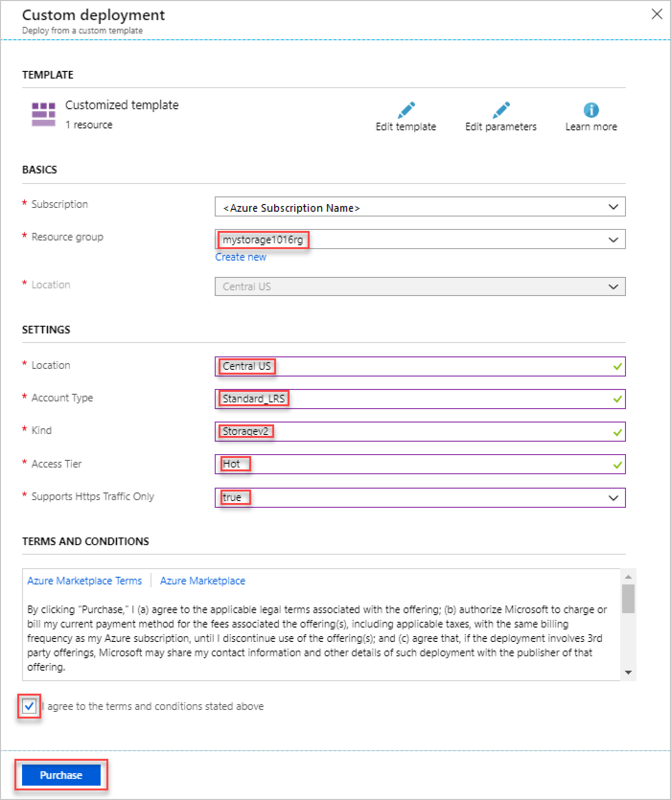 In the next section, you use a template deployment tool to edit the template. Select the Parameter tab to see the values you provided for the parameters. Write down these values, you need them in the next section when you deploy the template. Using both the template file and the parameters file, you can create a resource, in this tutorial, an Azure storage account. The Azure portal can be used to perform some basic template editing. In this quickstart, you use a portal tool called Template Deployment. Template Deployment is used in this tutorial so you can complete the whole tutorial using one interface - the Azure portal. To edit a more complex template, consider using Visual Studio Code, which provides richer edit functionalities. Azure requires that each Azure service has a unique name. The deployment could fail if you entered a storage account name that already exists. To avoid this issue, you modify the template to use a template function call uniquestring() to generate a unique storage account name. Select Build your own template in the editor. Select Load file, and then follow the instructions to load template.json you downloaded in the last section. Remove the storageAccountName parameter as shown in the previous screenshot. Two template functions are used here: concat() and uniqueString(). Resource group Select the resource group name you created in the last section. Location Select a location for the storage account. For example, Central US. Account Type Enter Standard_LRS for this quickstart. Kind Enter StorageV2 for this quickstart. Access Tier Enter Hot for this quickstart. Https Traffic Only Enabled Select true for this quickstart. Select the bell icon (notifications) from the top of the screen to see the deployment status. You shall see Deployment in progress. Wait until the deployment is completed. You can see the deployment status was successful, and there is only one storage account in the resource group. The storage account name is a unique string generated by the template. 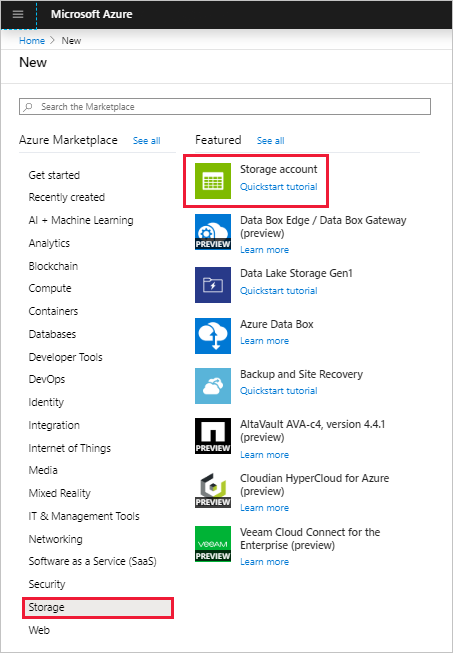 To learn more about using Azure storage accounts, see Quickstart: Upload, download, and list blobs using the Azure portal. When the Azure resources are no longer needed, clean up the resources you deployed by deleting the resource group. In the Azure portal, select Resource group on the left menu. Enter the resource group name in the Filter by name field. Select the resource group name. You shall see the storage account in the resource group. Select Delete resource group in the top menu. In this tutorial, you learned how to generate a template from the Azure portal, and how to deploy the template using the portal. The template used in this Quickstart is a simple template with one Azure resource. When the template is complex, it is easier to use Visual Studio Code or Visual Studio to develop the template. The next quickstart also shows you how to deploy templates using Azure PowerShell and Azure Command-line Interface (CLI).